Short post today - I have little desire to elaborate however the information is quite relevant. Though this is widely known studies of this size seem somewhat rare, Chitika, an adnetwork which I recommend as an alternative to the elephant in the room, just released a study of the click through stats of sites it's code is on. According to their sample size of over 8.2 million site impressions via search traffic roughly 35 percent of visitors came from the number one spot in the SERPs. Number two spot received almost 50 percent less traffic and the bottom of page one only received about 2.5 percent of the traffic. 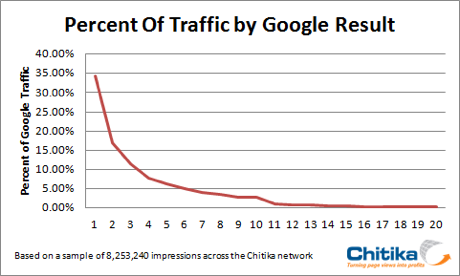 See the pics for a visual and actual data and check out this post for a good discussion of the topic of search traffic. Of course we knew this already but quite frankly I always guessed on the bottom of the page. These hard numbers are good to know. Always remember, improving your SERP rank should always be top priority for your online business. It can't be understated in importance.